Baa-rilliant end to College life for creative student! A creative student has finished her time at Nelson and Colne College baa-rilliantly after winning a women’s institute competition. Katie Smith (18) was among a number of Art and Design students at the College who were challenged to design an eye-catching cup transfer for Malham WI. 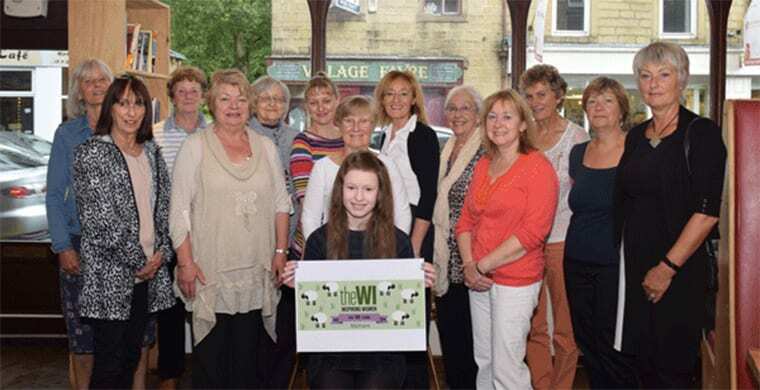 Her rural design, which included sheep and the WI logo, perfectly represented Malhamdale and the national centenary of the women’s institute, and as such it was selected by members as the overall winner. Katie, from Nelson, said: “I am really happy to have won this competition, and am looking forward to seeing my design on a mug. Katie was invited to Turners, in Barrowford, to see her enlarged design and collect a voucher and card from grateful WI members. Curriculum leader for Art and Design Joanne Hadcroft added: “We love to see our students taking part in real-life commissions and we are delighted to see Katie winning this competition. For more information about Creative and Digital Arts at Nelson and Colne College contact 01282 440272.